Happy Sunday all my stamping friends. Another challenge completed, This one I started last night and finished it today. This creation is for my son's PaPa ad today is his Birthday so I needed to make a card for him to give to PaPa. This is my take on The Sketch Saturday challenge. I hope you enjoy it! I made a card similar to this one for my DH Gramma ( I mean making it with the Balloons) but totally different colors. Here are the supplies I used: DP: My Minds Eye "Confetti" Celebrate "Brothers" Zig Zag/Dark Blue Paper. YoYo Yellow,sage shadow and white CS Swiss dots & Mosiac Embossing folder(for the balloons and the YoYo yellow panel) Yellow embr. floss and a Blue bow from Martha Stewart(pre tied of course because I cannot tie a bow for nothing! LOL) The Happy Birthday Sentiment is from a Hero Arts clear set that I have . So, Enjoy my creation and Have a wonderful Sunday afternoon! Hello all, Wow, It has been a while since I have been on here. I am so sorry for that. I have gone thru a little lack of creativity the last week or so. I have actually been at my desk every night but just couldn't get those creative juices flowing so tonight I am on a mission to get at least 3 challenges completed and posted to share with you all. No ifs ands or buts about it so onto the first one. 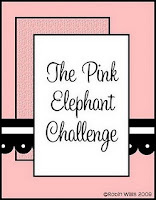 This one is from The Pink Elephant, What a fun site and this weeks challenge was tons o' fun! I started with a image from "Me and my big ideas. This was the first time this image has even seen ink and it was super duper easy to color in. I have like 5 or 6 of the M&MBI's stamps and they are all so darn cute, I'll share those with you all a little later . Hello again all, Just wanted to share some more candy that is out there in blogger world. I don't have any creations to share right now so I thought I would share some candy that I have run across. I will add more as I come upon them! Hello all, Well I completed another challenge. This one is from Sketch Saturday. I am a total sketch challenge junkie. Once I get goin on a challenge I just cant put it down until I have completed it. This one was no exception. I added a whole buncha bling on this one too. If anyone knows me they know that I love glitter and bling. Sometimes I will wake up and have these specks of glitter in my hair, on my face, just everywhere. So for this challenge I used an image from InStyle stamps called Joyce and Marcy. I colored them in with my Copics and also used a a jelly pen(on her hair band and bracelet) and smooch(in green apple) on the coffee cups. I embossed the blue CS with my D'vine swirls EF and the DP is from a DCWV stack. Prima flowers were added to the top right and I added bling brads to the middle of each flower. I also added some pink bling around both scalloped circles. Hello all, How is everyone doing this warm February day? Well at least here in The San Francisco Bay area, we are having 70 degree days. I cant believe it. They say it isn't going to last too much longer. We have 3 storms coming in this weekend so better enjoy this beautiful weather while we can. Hello all, Just a quick little creation that I wanted to share with you all. I just got this new stamp Designed by Elizabeth Bell for Susana's custom art and card design. You have got to go to her site. 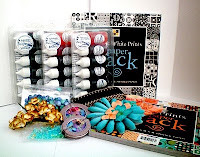 She has great prices on everything a paper crafter needs. I had never even heard of this site then I received a gift in the mail from a fellow paper crafter and the address was from someone in the bay area where I live so I had to go and check out the site and I was so excited. 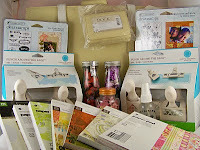 She carries Copics, Elizabeth Bell images,Victoria Case Images and all kinds of great crafting items. So when you get a chance, go on over and check out this wonderful site. Anyways, I couldn't wait to color my new image in. ( SCACD also has a few really easy tutorials on coloring in hair,skin and clothes with your Copics.) I am really happy with how my coloring turned out. Practice makes perfect and I am going to get lotsa practice. Here we have the projects that we completed at Gina's stamp camp tonight. These are just some totally adorable projects. Check out the 3 bottles in the holder. Isn't it cute? She had everything cut and scored for us to just put together and she even filled the jars with bubble gum, M&M's and jelly beans. So so cute! Then we put together a little milk carton and closed it of with one of the Stampin Up! clips(they are so teeny tiny) and the 3rd. and final project was a friend 3X3 card. I so look forward to her stamp camps every month. A fun and creative night out with a great bunch of ladies! Well, I am off to hopefully get my Valentines goodies done so I will be seeing you soon! Hello all, I haven't completed any creations lately so I thought I would share some fun candy that I have come across out in Blogger world. Jacquie's Joie de Vivre Ends Feb 22nd. Kristine- Lost in creativity Ends Feb. 7th. Susie Open until Feb 14th. A Latte Inkin' Fun-Open until Feb 28th.